A man can derive great satisfaction out of building something with his own two hands, so while that dude's feeling all high and mighty, you should totally go stomp his sandcastle in front of him. For a game built on that principle, try Knock Down Barns. 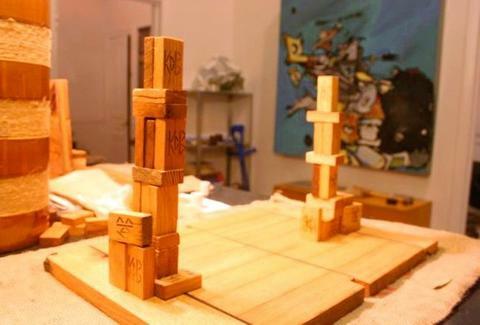 From a guy inspired by the reaction when his dog accidentally toppled a tower of dominoes, KDB turns the "knocking-stuff-down-is-fun" principle into an organized competition, forcing players to topple structures crafted from Jenga-like blocks of reclaimed barn wood, but not Barney wood, which is most definitely not fun for the whole family. The game starts with each player secretively constructing a "barn" behind a divider, with the requirement that each one be at least the height of said divider; the first shot falls to the player who finishes first, though if you always finish early, you really aren't much of a player at all. From there competitors take turns flicking marshmallow-shaped foam pellets paper football-style until all the blocks are completely knocked off the board, but when that happens you just gotta get back on. Vaya con Dios, brah. Down the line he plans to supplement barnwood sets with ones made from bamboo, which thankfully doesn't change the fact that you're totally going to stomp all over your friend's wood.